It’s the season for allergies- for you, and for your dog. The number one allergen for dogs isn’t pollen, it’s fleas, followed by food allergies and environmental allergies. The most common symptom of an allergic response is itchy skin. Scratch off. Itchy skin is torturous. It makes your dog lick, chew, bite, rub, scratch, and/or scoot. These behaviors can cause red skin, bald patches, sores and skin infections. Allergies may even cause your dog to develop a skin or ear infection. Kick off. Apoquel® is medication used for the treatment of pruritus, the clinical name for itchy skin associated with allergies. Apoquel® works by inhibiting the body’s trigger for itchiness and inflammation. Apoquel® comes in an easy to give pill, given twice a day for two weeks, and then only once daily after that. Clients report reduced itchiness in as soon as four hours, and scratching usually stops within 24 hours. 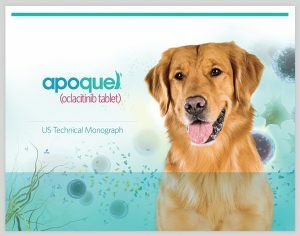 We can prescribe Apoquel® for short term use in pets with flea allergy dermatitis or for long term use in patients with chronic problems like allergic dermatitis. In addition to Apoquel we now offer an injectable medication called Cytopoint®, which targets and neutralizes interleukin (IL)-31, a key itch-inducing cytokine in atopic dermatitis. Cytopoint® begins working within 1 day and delivers 4 to 8 weeks of relief from the clinical signs of atopic dermatitis. Your dog will stop scratching, reducing the body’s allergic response while treating the symptoms. 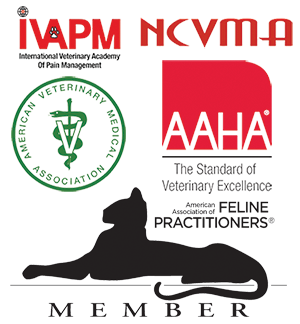 Talk to us about which is right for your pet. Keep off. Of course, the best cure for allergies is prevention, and the number one way to prevent flea allergies is to routinely give your dog flea medicine – all year long! Sound off. If your dog does start to scratch & itch, please give us a call. We can schedule an appointment for the doctor to assess your pet. We can then provide you with all the options to get and keep your dog healthy and happy, no matter the season.